Set in Africa, but not wholly African; an isolated nation, yet receptive to the outside world; hierarchical and conservative, yet innovative and desirous of modernity; conformist as a people, and yet fiercely independent as individuals—the Ethiopian identity defies definition. No sooner have you made a generalisation than you realise it does not apply to some other part of the country. 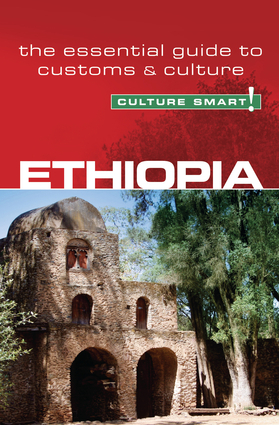 This is because Ethiopia was once an empire, made up of many different peoples and cultures. Ethiopia exists simultaneously in different time periods. It has a long documented history, and is undergoing very great change. Its people, when they see something new that might work to their advantage, will embrace it and find ways to improve on it. Modern democracy, however, has understandably been slower to achieve given the strong historical antecedents of it's monarchy. All Ethiopians are proud of their history. They are so proud, in fact, that some outsiders see them as arrogant. They are, perversely, also almost proud of the fact that their country was not modernized as quickly as other African states with a colonial past: their freedom is worth more to them than having an infrastructure for economic development. All these issues and more are explored in this compact Culture Smart! guide. Values, attitudes, daily social life and communication are all helpfully unpacked, and advice is given to help the discerning traveller, whether student, tourist or businessperson, make the most of his or her visit to this rich and complex land. Above all, it provides the tools to do so in a considerate and sensitive manner. On meeting a group of people it is polite to acknowledge all of them, including the driver or maid, with a handshake. When greeting a person, it is normal to bow slightly while you shake hands. This is done by placing the left hand on the right wrist as you shake.